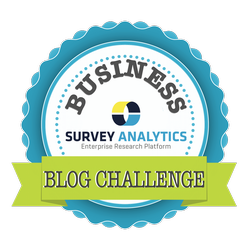 SurveyAnalytics Blog: Day 18: What’s Your Favorite Social Media Outlet? With so much noise on social media, sometimes it is hard to break through all of the clutter. Every minute of the day, Facebook users share 2,460,000 pieces of content, Instagram users post 216,000 times, Pinterest users pin 3,472 images, and the list goes on (keep reading to see the full image). And that's just what happens in one minute. To expand upon that, we firmly believe that different social media sites are better at some things and worse at others. A smart business knows what works well for them and what doesn't - and then leverages that to their advantage. That's why today we are reflecting on our favorite social media outlet, Twitter. We like using Twitter so much because it takes place in real-time and because people are engaging with us. Not only that, but each post receives the same amount of attention. Unlike Facebook, which has complicated algorithms to organize your news feed, it has recently lost almost all relevance for a business or brand without "paying to play." On the flip side, Twitter is still a highly viewed platform for businesses and professionals for providing rich content and reaching others. In this article by TechCrunch, we hear about how Facebook has altered it's algorithm to reward original visual content and ward against click-bait headlines. What this means for businesses isn't good; because basically in order to be seen, you better be paying for it. This quote from the article really sums up the situation. "It’s still the same pay-for-visibility situation, yet it combines with the natural decline of reach to cross some mental border that makes it feel like Facebook is extorting Pages for many in order to communicate with their own fans." And that's precisely why as a brand, Twitter is a much more fair place for us. On top of that, Twitter is very important from a customer service point of view. Like it or not, customers are reaching out to brands via social media in this era. If they are stoked about a product, they'll tweet about it. And the same goes for when they are upset or in need of service. If you aren't convinced on the relevance of Twitter, check out this article by Adage that gives 10 reasons why Twitter is a better platform for businesses than Facebook. So now we ask - which social media outlet works best for you? To figure this out, think about where your ideal customers are. Just remember that not all social networks were created equal. And what might work well for one brand may not for another, it all depends on the products or services you offer.